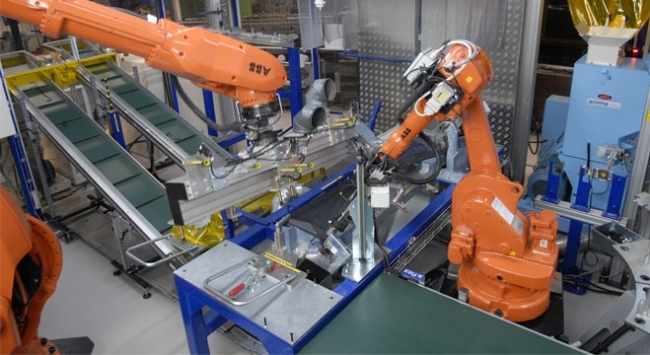 All across the world today, industrial robots perform tasks that range from palletizing boxes in a warehouse, to transporting hoppers of ingredients across a food preparation factory, to precision welding on a vehicle assembly line. The successful completion of these tasks relies on the accurate control of the robotic manipulators to provide the required dexterity. 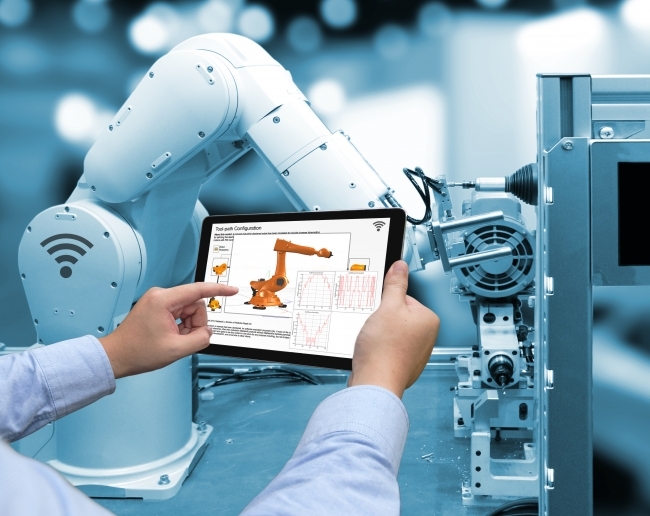 With over 250,000 robots installed worldwide, engineers at ABB’s Robotics business unit understand the challenges of designing and controlling robotic manipulators. Their design process includes rigorous testing with the aid of simulation models which they had been deriving using non user-friendly tools. The tedious nature of this process left them searching for a better solution. Working with a research team from Linköping University in Sweden, via the industry excellence center LINK-SIC, engineers at ABB’s Robotics business unit in Västerås, Sweden, set out to evaluate the use of MapleSim, the high-performance modeling and simulation platform from Maplesoft, to develop high-fidelity manipulator models that included flexible joints, gears, and dynamic friction, and to determine the ease with which the models can be exported and integrated with other software tools for simulation or controller development. Their goal was to create high-fidelity models that were realistic enough to replicate the operation of a real manipulator, while still being able to run simulations on a regular desktop computer. While their previous process of deriving models using methods such as the Euler-Lagrange formulation worked well, MapleSim’s graphical interface eliminated the need to derive and manipulate equations, drastically reducing the time needed to model a manipulator. MapleSim’s extensive library of built-in components enables users to simply drag and drop, then seamlessly connect components from different domains to create complex system-level models. This ease of creating models radically changed the way in which design engineers at ABB worked. They now had a more user-friendly and flexible modeling tool. Using a combination of multibody mechanics, 1-D mechanical, electrical and custom components, they were able to create multiple models of their robotic manipulator with MapleSim, in the same amount of time it was previously taking them to create just one model. Having built a series of models representing the manipulator, the next step was to integrate them with the rest of the system for testing. ABB performs system-level testing using a complex test environment built with Simulink. Therefore, it is vital that the tool used to generate the manipulator models is able to export to, and integrate with Simulink. This capability is provided by the MapleSim Connector, which enables users to export any MapleSim model to Simulink, including models with custom components. The MapleSim Connector automatically creates S-function blocks from the symbolically simplified system equations, thus creating code that is compact and highly efficient. The simulation results using the MapleSim models were comparable with measurements obtained from a real manipulator – demonstrating conclusively how MapleSim can be used to generate and export high-fidelity multidomain models that replicate their manipulator’s behavior. As a result of the research carried out by the team from Linköping University, ABB has adopted MapleSim for model creation. As their engineers continue to develop new ways to increase the fidelity of the models they use to test their products, MapleSim will be an integral part of that process moving forward.